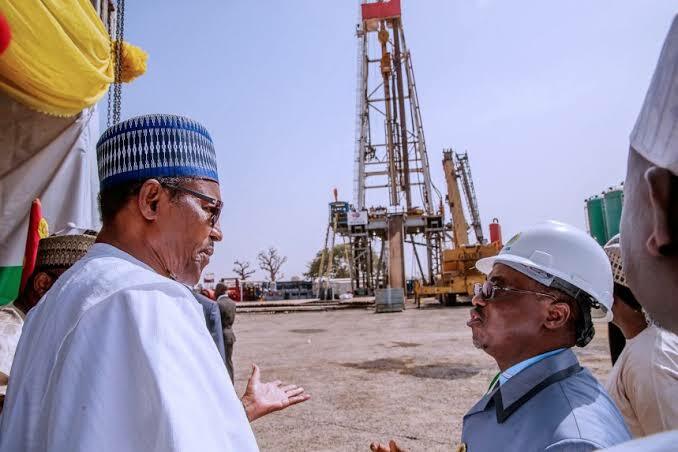 Renewed search for commercial hydrocarbon deposits in Nigeria’s frontier explorations basin moved from the drawing board to the oil fields on Saturday with the official flag-off of drilling activities in the Kolmani River II Oil Well in the Gongola basin of Benue Trough by President Muhammadu Buhari. The event which is known in oil industry parlance as Spud-in is coming as the second attempt at actual oil drilling in the basin following an earlier undertaking by some International Oil Companies in the early 1990s which was abandoned midway. However, in line with Presidential directive on increased exploration in the frontier basins, the Nigerian National Petroleum Corporation (NNPC) acquired advanced data and technology to drill deeper for more discoveries, thus adding fresh gusto to the quest for oil find in the Frontier Basin. Speaking at the event Saturday President Buhari commended the Corporation for rallying men and machine to re-invigorate exploration operations in the basin, noting that Nigeria needed to secure her energy sources which, he said, should not be from only developed oil basins. The President further highlighted that the frontier basin exploration efforts which culminated in the Spud-in of the Kolmani River II Well would guarantee a new Nigeria with balanced resources distribution, strong economic base, and industrialization. President Buhari stated that a key aspect of the Economic Recovery and Growth Plan (ERGP) is ensuring national energy sufficiency which is unattainable with hydrocarbon resources from conventional basins, adding that noting that exploration on frontier basins is a national imperative and a core policy thrust that must be sustained. He assured that further exploration in other basins such as Chad, Bida, Dahomey, Sokoto, and Anambra, would be stepped up. In his presentation, NNPC’s Group Managing Director, Dr. Maikanti Baru, stated that apart from the Presidential directive on inland exploration, the drive to return to the basin was further propelled by the fact that neighbouring countries were making hydrocarbon discoveries from their own end of the basin. Baru indicated that while the IOCs who previously explored the basin through Kolmani River-1 well, drilled down to less than 9,000 feet, the corporation would go as deep as 14,500 feet in the Kolmani River-II well. The NNPC GMD called for patience and understanding on the part of stakeholders, saying that oil search was a painstaking and often slow process. “Of course, as you are aware, the Niger Delta is well explored and exploring frontier basins in areas that have not been explored are normally very risky and costly, and because the private sector does not want to take that risk, they expect the government to go out and look for it and once the reserves are established, then the private sector will come in and develop them,” he said. Dr. Baru said the Corporation had learnt a great deal from previous operations in the Niger Delta, revealing that NNPC was conscious of the environment, and was working relentlessly with host communities ahead of its planned operations in the inland basins.